Adrian Santesteban is a Math & Computer Science certified teacher at Williams Middle School at Houston ISD in Houston, Texas. 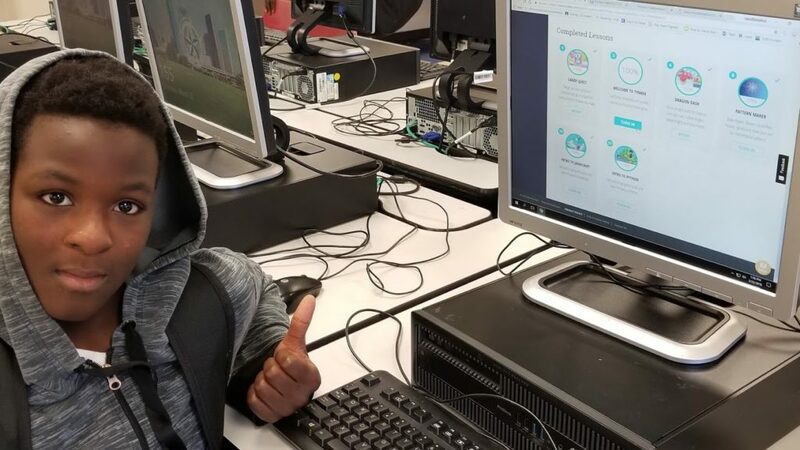 He teaches his students to have Wolverine Pride as well as to code! A Tynker leader in Texas, he has taken the time to share his thoughts about Tynker’s impact on his students. Tynker is a fun, engaging tool I use to teach coding. It has great coding lessons that teach coding fundamentals in block and text coding. Best of all, they are automatically graded and the entire class grades can be accessed in the teacher dashboard’s gradebook. Students find the lessons challenging, yet motivating. When they finish a lesson, they feel a sense of achievement that motivates them to keep learning. Students in Mr. Santesteban’s class are rocking their Tynker lessons. I feel Computer Science is ubiquitous, so understanding it at least at a basic level is fundamental. Plus, it teaches students problem-solving skills and perseverance that they need to succeed in all classes. Tynker is one of my go-to resources I use to teach coding because kids need to like what they are doing in order to engage in learning, and Tynker makes learning fun! Is reading only for ELA class? Of course not! Computer Science is not just for STEM – it should be incorporated into all classes and every subject as a learning tool. Nowadays, technology is ubiquitous, and therefore, students of all ages should learn using technology as a way to facilitate instruction and make it more engaging. There’s been a real movement to bring Computer Science for all students recently. Thanks to the work of organizations like Tynker and Code.org, we’re much closer to making this a reality. We need to continue to push forward with this momentum because it is important that the United States doesn’t fall behind other countries with regards to CS education.